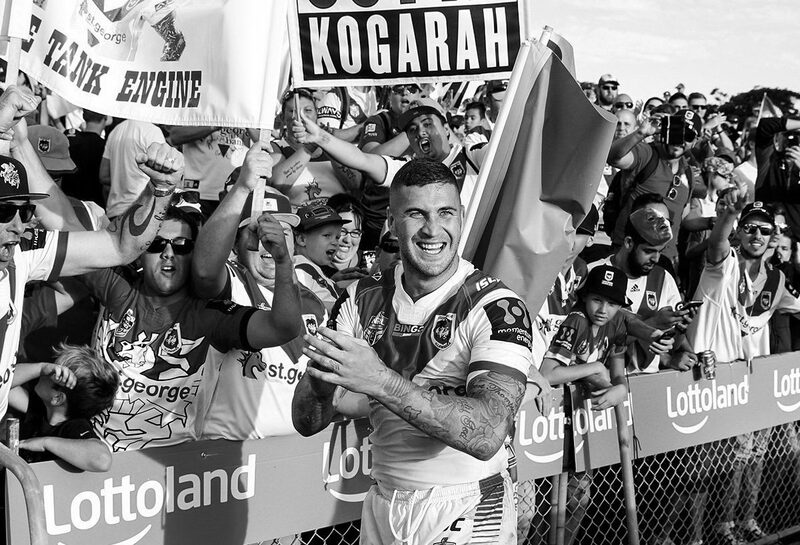 Meet Joel Thompson, he is an Australian professional rugby league footballer who has played for Melbourne Storm, Canberra Raiders & at the time of this interview played for St.George Illawarra Dragons of the NRL. An Indigenous All stars and NSW Country Origin representative, Thompson primarily plays at second-row and centre. He talks of once being an “angry” young lad who had a rough upbringing, who was headed down a dark path where many have been lost, including his own relatives. The St George Illawarra star’s most recent community projects have involved being a mentor at Mission Australia, Mentor at the Rieby Juvenile justice Centre, and has become a NRL ‘State of Mind’ ambassador… plus much more. But to understand where that built-up anger came from as a youngster, the NRL player takes us back a little, to his dark past. For Joel it’s was his grandmother, who helped keep him on the straight and narrow during a turbulent childhood surrounded by domestic violence, drug & alcohol abuse & getting involved in juvenile crime. A dedicated father & positive role model to three young daughters, a very loyal & loving husband to wife Amy, Joel has accumulated numerous life achievements & honors than I can even mention here. Now in 2018, he is the Founder of The Mindset Project, a mental-health and motivational initiative which aims to help people develop a positive view of their potential and make life choices that promote growth and wellbeing. Joel works to break down what creates a mindset and develops strategies to build a healthier one for the future. And like any project, people need to be equipped with the skills and techniques required to take on challenges, work harder and develop resilience. Through our engaging face-to-face workshops, he shares motivational and personal experiences, and provide the tools and resources that schools, sports clubs, cultural organisations and businesses need to foster improvement of their mindset and mental-health wellbeing. To hear Joel’s story & the ‘gold nuggets’ he chooses to share with us, take a listen here. Flerida & Mas Sajady offer an in-depth dialogue touching on the topic of transcending Cyberbullying and Victimhood.